wasn't this linked to in the actual post ? what bit are you missing exactly ? no need to recreate the ts, simple change your Use Toolkit packages steps from MDT 2012 to MDT 2013.. I was running through the sequence to create the updated packages - creating an MDT task sequence in order to create the Tools, Settings etc. packages - but these never got created because of a problem creating the boot images. Do you have 2013 integrated with 2012 SP1 then? Is there another easy way to create the Tools package? Is this the only package that needs updating? no i dont, and i didn't get time to update my lab tonite either, i'll try tomorrow. Everywhere I've looked it says to not install MDT 2013 with SCCM 2012 SP1 - only with R2. So, I don't think I'm going to be able to get away with this. I just need to work out why that backup script is failing. Will do some more digging. OK, setting the variable %OSDisk% before the backup routine does seem to work. I am setting it to D:\ but from the playing around I have done, it doesn't really matter what this is set to - the fact that it is set seems to cause the script to run properly and then query the drives/partitions anyway to pick up the correct drive name. Think I'll do some more playing to back up all found partitions, in that case, so that data drives etc. are backed up too. Which actually leads me on to another question....Do you know, off the top of your head, whether these scripts take recovery partitions in to account? If I were to point the scripts to a laptop to either upgrade the OS or totally reinstall, would the manufacturer's recovery partition remain untouched? I'm guessing no on a 'new computer' install, but what about a 'refresh'? I have created HTA boot image as you instructed but unable to find it in task sequence where i can map hta boot image , was i missing something. because of this i am unable find it after winpe boot in task sequence list. in the task sequence , i have disabled some of the unwanted items which i dont require it at the moment like TPM & MBAM , language pack & Dell . actually i am looking for simple task sequence of boot win PE , capture profile & c drive data(offline hardlink), intstall OS in C , restore profile & data in sccm 2012 sp1. i have remapped my old MDT toolkit package with adding customsetting.ini file which is actually available in MDT setting package so i updated that too. in task reference, i can see OS image, MDT toolkit package & MDT setting package , USMT but not Boot image. actually i was created MDT sequence through create MDT sequence which is available in sccm 2012 sp1 after installing MDT 2012 update1, is it wrong to create MDT task sequence from there or any other way . 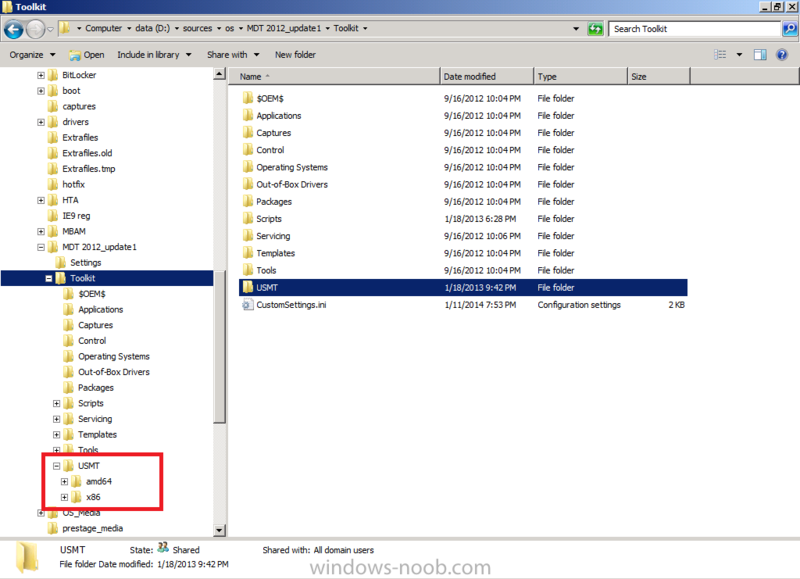 old post: actually i am looking for simple task sequence of boot win PE , capture profile & c drive data(offline hardlink), intstall OS in C , restore profile & data in sccm 2012 sp1. I'd appreciate if you create a new thread describing your issues, as this thread is all dedicated to the CM12 BitLocker FrontEnd HTA. Is this in the HTA TS already? If not, I guess I can just put it in before the 'Backup' section. Will I need to do anything with the back up name or does the ZTI script create differently named .wim files itself for each partition? Or, does it just create the one .wim? Looking at restore options now. In your TS I don't think there's an option to just do a full restore from a backed up .wim. Is this a fairly straightforward addition? I'll have a look but you'll better know than me! Also, was just wondering why the additional Windows partition is not being created for non-UEFI installs? Is this system partition created elsewhere in the TS via an MDT script that I have missed? Kind of ties in with my question on 'Recovery' partitions. From what I can tell in the TS, if we have an unformatted disk, the multiple partitions are created for UEFI and the single for standard BIOS. If the disk already has an OS on it, for 'New' installs, a single partition is created - there is no UEFI checking/creation section. For 'Refreshes', the disk structure is left as-is. Guess I need something in between that keeps data partitions, if present, but also creates the Windows system partitions if they're not there, like when upgrading from XP to Win 8.
there is no option to restore the backed up WIM in the CM12 BitLocker Frontend HTA, all restore options are for data backed up via scanstate, I may add a restore wim option in a later addition (actually i'm working on a backup/restore HTA separately which is dedicated to network backup, you'll need to restore the wim file and the corresponding bootloader. I may release a version of this functionality in the future but right now it's being developed..
Yeah, that would be cool. I did have a quick look though, and it looks like imagex is not recommended for this sort of thing - http://support.microsoft.com/kb/935467/en-gb What are your thoughts on that? Could you also please give me your thoughts on the partition stuff in my earlier post too please, as it would help me understand things a lot more. Looks like the source location doesn't exist - does this mean I haven't installed the USMT package to the machine? Can you also please clarify why one step uses x86 USMT and another further along uses x64? i've backed up and restored Windows XP,7 and Windows 8 just fine with imagex, i'd suggest you test it yourself and come to your own conclusions as to it's effectiveness. so your toolkit package source looks like this and the usmt x86 (and x64..) sub folders are within the USMT dir..
Me bad. Didn't have the USMT folder copied to the Tools! Awesome HTA! I've nearly finished piecing it all together but I've hit a snag! In the New Computer/New Installation pane of the HTA the Restore option is only presenting me with No Restore or SMP. I have checked the Connect to Network Folder step in the Task Sequence and the the relevant drive is mapped and can be browsed in WINPE. This seems to be the issue? Is this supposed to be dynamically set or am I missing something? I set that to the drive letter that I mapped to in the task sequence and it works! Thanks again for such an awesome tool. 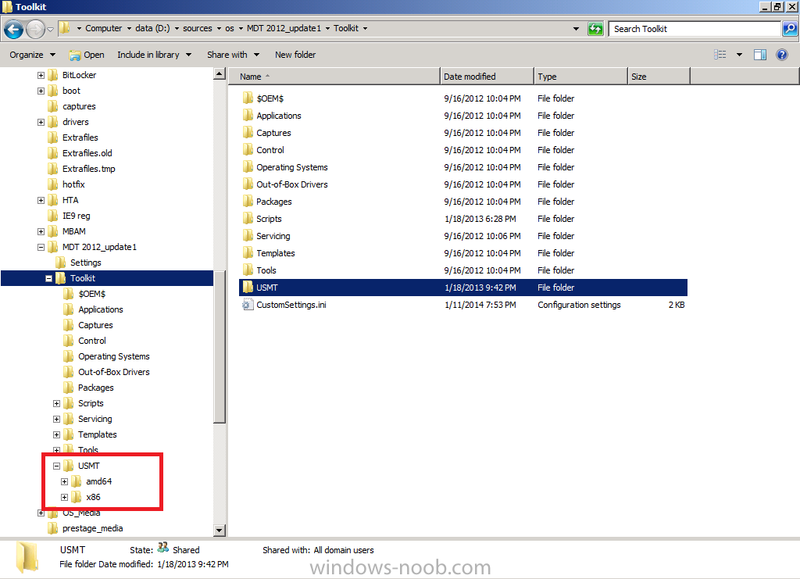 Do we have to update to MDT 2013 to get the WIM Backup functionality working? shouldn't need to see the comments above up a few posts..